Freighter: Built in 1918 by the Todd Drydock and Construction Co., Seattle, WA; Launched 29 May 1918; Acquired by the Navy 2 November1918 and commissioned the same day; Decommissioned 21 April 1919 at New York and returned to the United States Shipping Board; Transferred to the United Kingdom in 1942; Sunk by gunfire from a submarine 24 June 1942. Specifications: Displacement 10,690 t.; Length 396'; Beam 53'; Draft 24'; Speed 10.5 kts. ; Complement 52; Armament unknown. 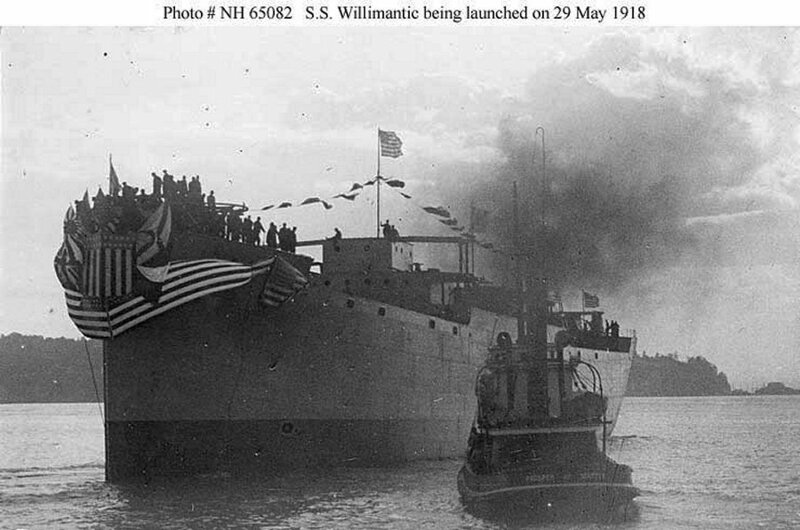 109k Being launched at the Seattle [Todd] Construction and Dry Dock Co., Seattle, Washington, on 29 May 1918. The tug Prosper of Seattle is assisting.